I came across these boots on Instagram way before Christmas and lusted over them for months and months before finally get my hands on a pair. I am so obsessed with Gucci - boots, loafers, sunglasses, belts - everything. 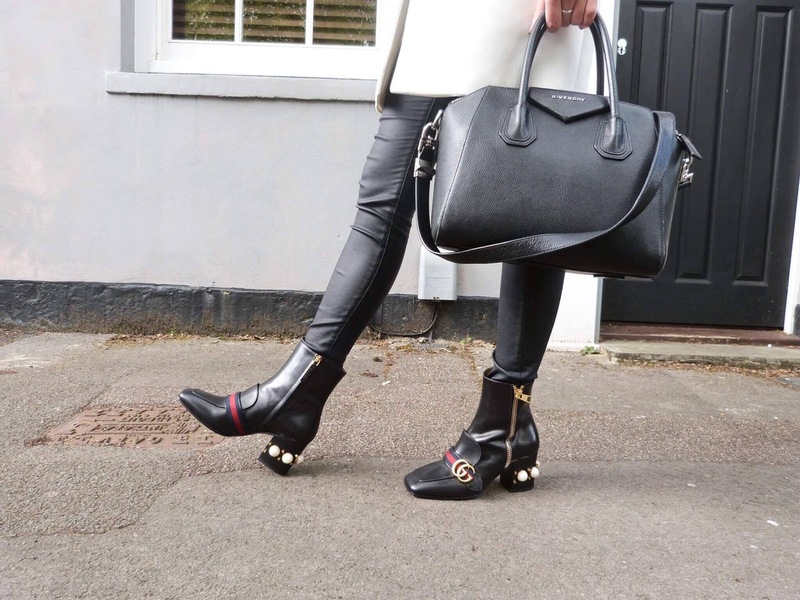 As I've said previously, I'm a firm believer in good shoes, not just completing an outfit, but taking it to a whole new level - and these boots do just that. Further, add a good bag and coat and you're set to go. This works for literally any outfit - whether you're going on a date, for lunch, dinner, or just shopping. Keeping your basic outfit minimal and adding statement pieces transforms your whole look within minutes. I adore the pearl detailing on the heel that revolutionises a fairly masculine looking boot. I found this coat in Zara and had to have it. The bell sleeves against the sharp tailoring creates such a sophisticated but girlie look. 'Girlie' is a look I would usually would steer clear of as it definitely doesn't sit with my style, nor my taste, but this coat pulls it off in such a way that I fell in love. It comes in two other colours; black and blush pink - I think i'll be returning soon for the black. To keep the outfit looking too 'sweet' with this coat, I added my coated jeans and a turtle neck, finished off with my trusted Givenchy handbag. I'll hold my hands up and admit I use this bag far too much, but it goes so well with everything that I find it hard to part ways with it for any longer than a couple of days!! I have struggled so much over the years to find a good, tight-fitting pair of coated jeans, so when I came across these ones from MissGuided I was more than excited! As I wear black jeans A LOT, these are such a good alternative to mixing up my outfits.